Digital Heritage: Revival of the Value of Cultural Properties, a policy forum headed by the Cultural Heritage Administration was held at the National Palace Museum of Korea from July 8th to 11th to allow visitors to experience 4D technology. The event also provided d’strict CEO Chey Eun-seok an opportunity to give a presentation on the restoration and utilization of cultural properties using 4D technology. Digital Heritage was an innovative showcase where visitors experienced virtual reality created by combining advanced 3D technology and display with NUI (Natural User Interface: a body-movement-controlled interface). On display were Hyper Stage Miniature, a 3D hologram stage; Hyper Circle, an interactive 3D panoramic (semi-circle) display; and Hyper Mask, an interactive augmented reality program with which users can select and play virtual instruments. Over the course of the 4 days, the event was attended by a great number of cultural officials as well as general public. 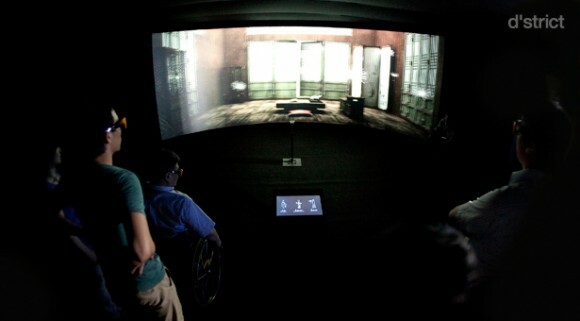 A Walk in the Clouds lets users experience a maximized virtual reality on a panoramic display through various natural motions (walking, running, and jumping). A lifelike experience is provided in a virtual environment where users can walk, run and jump amongst digitally recreated cultural properties and natural environments. 문화재청주관 ‘디지털 헤리티지: 문화유산의 가치 활성화’ 정책토론회가 지난 7월 8일부터 11일까지 고궁박물관에서 개최되어 4D technology를 이용한 showcase(체험관)를 열고 디스트릭트의 최은석 대표이사는 4D Technology를 이용한 문화재의 복원과 활용을 주제로 발표를 했습니다. 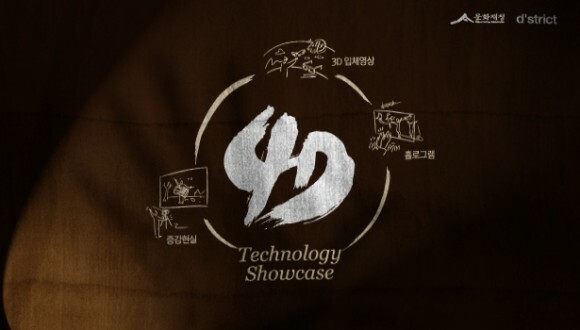 이번에 개최된 4D Technology showcase는 최첨단 3D 기술과 디스플레이, 그리고 NUI(Natural User Interface, 자유로운 신체형 인터페이스)를 결합하여 실제와 같은 가상 공간을 경험할 수 있는 새로운 형태의 전시였습니다. 3D 홀로그램 영상 무대인 Hyper Stage Miniature, 180° 서클타입의 인터랙티브 파노라마 3D 입체영상의 Hyper Circle, 가상의 악기들을 선택하여 연주하는 인터랙티브 증강현실 Hyper Mask가 전시 되었고, 많은 문화재 관계자와 일반인들이 관람했습니다. 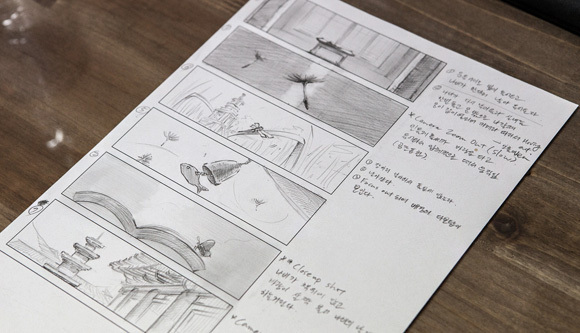 는 180° 파노라마 3D 입체영상을 자연스러운 동작 - 걷고, 뛰고, 점프하는 등- 으로 조작하여 최적의 몰입된 가상현실을 구현했습니다. 극 사실 영상기술로 재현한 유형문화재와 자연공간을 실제로 걷고, 뛰고, 점프 하는 등 자연스러운 움직임으로 영상을 조작해 가상공간에서 현실과 같은 경험을 제공하였습니다.